This page is a website creation support page. In Dreamweaver CC, when designating a color, a color picker like this one may appear. 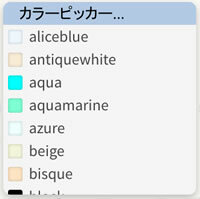 There may be no problem if you understand the English name of color, but the color may not be understood well because the picker displayed is small. So here we tried listing the color names and hexadecimal color codes displayed in Dreamweaver CC. Click the color name to make the background its color. If you specify an English name like " style="background-color:ghostwhite" " in HTML, its color will be displayed. It is "Alphabetical order" according to the order in Dreamweaver. Click on the color name in the list and the background color will be that color. By the way, we think that the background color in this frame is "GhostWhite #F8F8FF" and it is displayed slightly close to wisteria than the light gray of "#F8F8F8".